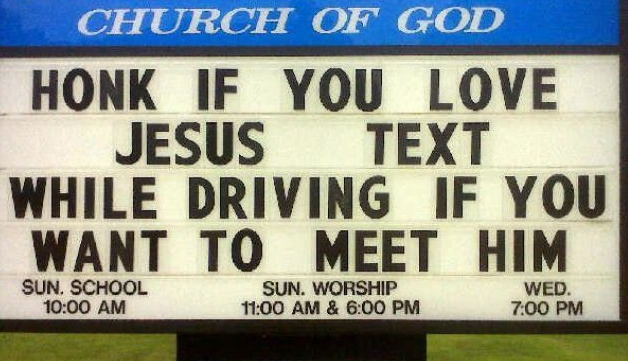 This sign is so poignant to what I have been trying to portray regarding Texting While Driving. As I have said before I ride a motorcycle and have experienced many times the hazards of someone using a cell phone while driving. It is not only dangerous to you, as studies show that it blocks your peripheral vision, it is also proven to be the cause of many accidents that have ended in fatalities. When I read this church sign I thought what a fantastic message. So fantastic that I have had it put on the back of t-shirts in the hope that it will save some lives. 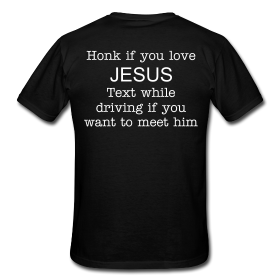 I know when I wear it, motorists will see and read it as I pass them, or they pass me, or whenever they are are driving behind me. FocusDriven is an advocacy group for victims of motor vehicle crashes involving drivers using cell phones. They work with those who support their mission and want to make our roadways safer for all motorists.